This video was produced by the Office of Special Needs and the Life Issues Department for the Youth Rally and Mass for Life, held at the Verizon Center in Washington, D.C. on January 22, 2010. It shares the story of Maddie, who reminds us of the dignity and joy that can be found in every human life. Copyright 2010, Archdiocese of Washington. Posted with permission. On Sunday, October 23, 2011, the Archdiocese of Washington hosted its Second Annual White Mass, celebrated by His Eminence Donald Cardinal Wuerl, S.T.D., Archbishop of Washington. The White Mass, which was held at the Cathedral of St. Matthew in Washington, D.C., honored Catholics who have special needs and those who work to support them. The Mass has the designation of white, because of that color's connection to Baptism. All guests were invited to join the clergy that day in wearing white, as we renewed our baptismal promises. Copyright 2011, Archdiocese of Washington. Posted with permission. On November 27, 2011, the First Sunday of Advent, the Catholic Church introduced the new edition of the Roman Missal. 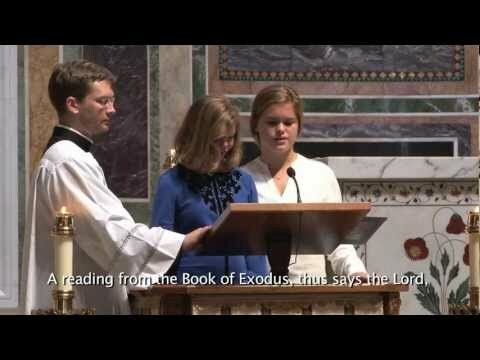 On March 22–24, 2011 a [series of] video clip/s was created by a national team of experienced Deaf persons, clergy, pastoral workers, and liturgical interpreters for reference and practice while preparing to interpret the new translation of the Roman Missal into American Sign Language for the Catholic Deaf Community. This project has made sign choices based on the Liturgical meaning of a particular sign in context. The project was done in English using ASL (American Sign Language) and for use in any area where ASL is used. This resource is an invaluable resource to many sign language interpreters who have no training in their local areas, for small group interpreter workshop lead regionally, in many communities in the USA and Canada as we prepare to celebrate Liturgy all together as one Body of Christ.